| June 1, 2017 | Tennis icon and entrepreneur Venus Williams was recently awarded the opportunity to work with another icon of athletics: Midtown Athletic Club and The Hotel at Midtown in Chicago. 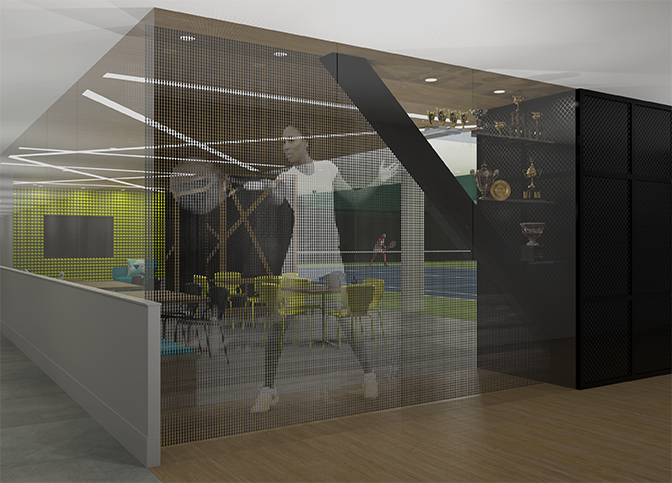 She and her team at V Starr Interiors designed the Tennis Lounge at the club’s flagship location in Chicago, which is undergoing a landmark renovation, as well as The V Suite for the new The Hotel at Midtown. The spaces designed by V Starr Interiors are intended to take the guest on a journey from active and strenuous to a state of respite. The Tennis Lounge features bold color and energetic, diagonal lines that promote an active atmosphere. Inside the lounge, electric shades of yellow and green complement sophisticated wood grains, teal seating, and a striking feature wall composed of tennis balls. In a stark contrast to the tennis lounge's high frequency, The V Suite conjures a sense of rest and rejuvenation. The suite was named in a reference to Venus' nickname and that of V Starr Interiors. 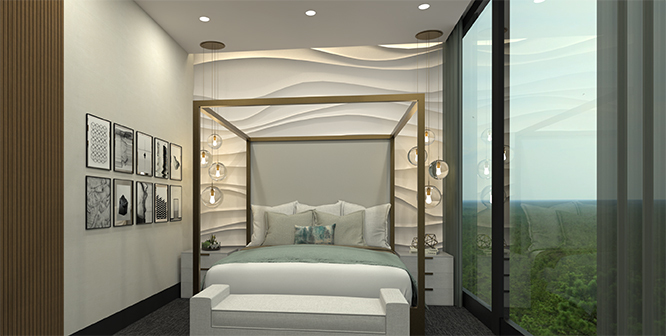 It will feature a living area composed of sultry, soothing tones complemented by pure whites in the bedroom. When complete, Midtown Athletic Club and The Hotel at Midtown will be the largest premier health-and-fitness property in the U.S. at more than 575,000 square feet. The athletic club is slated for completion in July 2017 and will include additions and renovations to Midtown’s flagship property, which was originally constructed in 1970 as the world’s largest indoor tennis club, and the addition of a 55-room boutique hotel to create America’s largest athletic club. 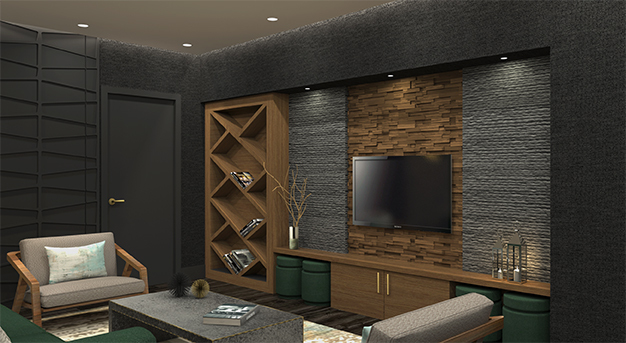 The Hotel at Midtown in Chicago, scheduled for completion in October 2017, will have four private suites, including The V Suite designed by V Starr Interiors. For this project, V Starr Interiors worked with a long-time partner of Midtown Athletic Clubs, DMAC Architecture, who provided primary architecture and interior design services for the facilities. The look and feel established by DMAC celebrates guests and brings in the urban environment of the surrounding neighborhood, addressing contemporary values around luxury, health and community. To pay homage to Venus Williams’ history at Midtown, the club’s boutique shop will carry her activewear line EleVen. V STARR Interiors was founded by professional tennis player, Venus Williams, in 2002. Combining Williams’ value for excellence as an athlete with her passion for design, V STARR Interiors is a full-service commercial and residential interior design firm. High-profile clients such as InterContinental Hotels, Midtown Athletic Club and The Hotel at Midtown, Curio by Hilton, and Howard University among others, have turned to V STARR Interiors to successfully translate their vision into reality. The company is based in West Palm Beach, Florida. For additional information, please visit www.vstarrinteriors.com. Midtown Athletic Clubs manages a portfolio of super-premium health and fitness clubs in the U.S. and Canada, including Midtown Athletic Club and The Hotel at Midtown in Chicago, which is scheduled to open in July 2017. Midtown provides members and guests with the places and people to help them live healthy and happy lifestyles. Midtown Athletic Clubs feature the best of everything at world-class facilities – from spas to swimming pools, tennis to turf training, bistros to boutiques, and of course, state-of-the-art fitness. For more information, please visit www.midtown.com. DMAC is a full-service architecture firm based in Chicago, IL, specializing in commercial, hospitality, and select residential projects, with a portfolio ranging from simple interiors to complex buildings. Founded in 1995 by Dwayne MacEwen, the firm prides itself on its ability to generate exceptional, unique and award-winning work. Each project is based on the fundamental approach of identifying the distinguishing elements, with the belief that the careful development of ideas is more important than a dependence on a style. Providing clients with innovative and custom tailored designs, DMAC takes a holistic approach with the philosophy that architecture contains the arts, and is not just a container for the arts. Under MacEwen’s leadership, DMAC respects the past without attempting to repeat it, experimenting while basing the firm’s foundation on successfully executed projects. DMAC is known for its extensive knowledge of current fabrication methods, designing and developing interior elements in addition to traditional architecture. Notable projects include Midtown Athletic Club, Michael Jordan’s Steak House, Roka Akor, Doc B’s Fresh Kitchen, Rivers Casino and Resort, Mario Tricoci Hair Salon & Day Spa, and Lamborghini Gold Coast, with a host of prestigious projects underway. Launched in 2012, EleVen by Venus Williams is an active wear line that ‘Fashions Healthier Lives’ with a mission to motivate and empower women to feel confident, strong and express their individuality. Bringing style to fitness, the emphasis of each collection is not only on how the clothes perform, but the design inspiration with the introduction of a new color pallet and prints. The high-quality pieces offer flattering feminine fits in beautiful fabrications. The collections of fitness and tennis are designed to allow women to strive each day without limits. In a world where ‘10’ is a just a number, EleVen is a lifestyle! To learn more, visit elevenbyvenuswilliams.com.